First of all - Thank You very much for your participation at the 46th International Conference in Krakow. 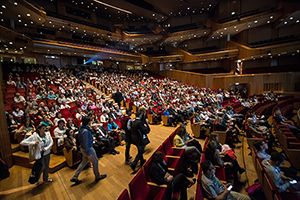 We hope you have enjoyed our Conference and have shared your experience and knowledge with your colleagues and friends. To improve for the future, we would very much appreciate if you can take your time to give us your feedback on the Conference. By filling out the evaluation form you will give us valuable information and the opportunity to make positive changes in future conferences. Thank you very much for your valuable input! We would like to express our appreciation for the valuable support our Industry Partner brings by participating at the 46th EDTNA/ERCA International Conference. Partners’ support, involvement and advice are greatly appreciated and the success would not be possible without the fantastic collaboration we have. Thank You very much! 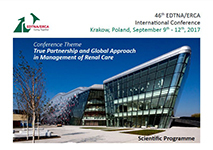 We are proud to introduce you to the Conference theme - ‘True Partnership and Global Approach in Management of Renal Care’. Our aim, as usual is to make this an unforgettable Conference in the historical city of Krakow. The Conference is a showcase for the latest technology and innovation in the treatment of Chronic Kidney Disease and our delegates are keen to view novel therapies, products and services at the exhibition area in conjunction with the excellent scientific program. The Conference therefore also provides an invaluable opportunity to promote therapies & products not only across Europe, but around the world.